Well, it seems things are starting to pick up in the old backyard! Funny thing is that they all showed up after a big rain! I think everyone was basically looking for a dry place to eat, but word of mouth (or beak! ), works every time, and before you knew it, the place was jumpin'! The next to join us was Chuck, our resident groundhog, who doesn't usually come up on the patio. I guess he figured it was O.K. to come up, being as how Mr. Bunny led the way ! Next was a new visitor to the BY, one we had never seen before. Rather exotic-looking and very brief in his visiting time, he had us running for the bird atlas! Turns out he was a Yellow-plumed Night Heron, and is not usually seen in this area. His usual hangouts are in marshlands, so we figured he got a little off course. It was neat to see some strangers in the yard for a change! Then, of course, we had Mrs. Duck and her new family pay us a visit, too! 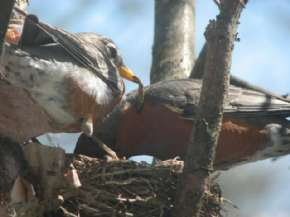 This is the third brood that we have seen so far this year, and we really haven't gotten that far into the season yet! It was a real joy to see so many critter-friends, old and new, back in the yard. All we need now are some hummers to make it a real nice summer! Hope you enjoy the shots! Another sure sign of Spring. New babies are always a joy. Hello ! When I'm not watching the Drives or cleaning up my photo database, I'm outside these days. A splash of red ! It seems the only birds making a real statement right now are the goldfinches! I'm not sure if Winters are really getting colder, snowier and longer of if it's just me that's feeling them more but but I, for one, sure am glad that Spring has finally begun to peek it's head out around these parts. Now if only I had time to get to that yard work, LOL. I'm at a loss for words here, so bare with me. I have just learned of the passing of an 'online' friend and contributor to this blog. Eleanor, who has shared her Backyard (Central Park) with us on many occasions, passed away on Dec. 20, 2008 following an illness. While known for her many talents, acting and photographer, she also devoted countless hours toward watching out for the birdlife at Central Park. In short she was a very Special Lady who touched many lives, in many ways and will be well and truly missed by all who knew her. Please join me in including her family and friends in your thoughts and prayers. God Bless.